vcloud | RJ Approves This Message! I wanted to give you a quick-read introduction of vCloud Hybrid cloud manager. vCloud Air Hybrid Cloud Manager enables bidirectional VM mobility and migration to the cloud and back, and hybrid networking to extend on-premises vSphere vCenter networks into vCloud Air. Data transport features include network extension, WAN optimization, Multi-tenant WAN with Intelligent Routing, and path fail-over. Security features include Suite B-compliant AES-GCM with IKEv2, data de-duplication and compression, AES-NI Offload, Flowbased Admission Control. It gets interesting because Hybrid Cloud Manager owns the source and destination encryption and decryption, ensuring a consistent security policy and providing admission for hybrid workflows like virtual machine migration and network extension. These features can be deployed in several ways. Hybrid Networking (Layer 2 Extension) can securely extend your vSphere vCenter to integrate with a vCloud Air Virtual Data Center (vDC). We can also stretch multiple L2 segments and can route stretched networks via Cloud Gateway for encryption and through the WAN optimization appliance to provide a secure and optimized path through the Internet to vCloud Air. Read more at the official doc here. The vCloud Air 200$ signup credits was nice because it helped me play with the On-demand virtual private cloud subscription. vCloud air is quite powerful and the UI is quite responsive. The waiting times increase when you use the vCloud Director UI because of the automation hooks in the back that need to get updated. One thing I tried to do is deploy an ESXi ISO in my catalog and tried to deploy a nested hypervisor. This however failed because VT was not enabled in the virtual machine BIOS. I used my VMware Fusion and built a virtual machine (no OS) with VT enabled in the BIOS. I exported it as a OVA and imported that to my vCloud Air catalog. I then attached the ESXi ISO from my ISO catalog and viola! 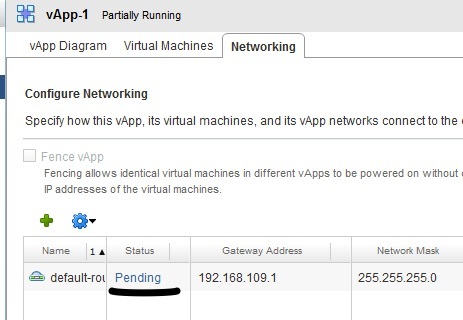 – nested ESXi hypervisor in vCloud Air. For your convenience I have the OVA attached here. Just download and upload it to your vCloud Air catalog –> attach the ESXi OVA –> Power on and install and deploy nested VMs! OUCH – DISABLING DRS IN VCENTER DESTROYS ALL RESOURCE POOLS LEAVING VCLOUD DIRECTOR INOPERABLE! I haven’t tried this yet but turns out disabling DRS literally destroys all resource pools and leaves vCloud Director inoperable. Sounds nasty but thats what VMware is telling us. Well so is there a fix? Well seems like there isn’t! You have to recreate the entire environment in vCloud Director which, can be, a lot of work. Not just you have to clone the vm’s in vCloud director as existing vms will all be deleted with the work around suggested by VMware. Disabling DRS in vCenter Server destroys all resource pools and renders vCloud Director inoperable. It is recommended that you contact VMware technical support for assistance with recovering from this issue. Here is the full KB article that also has the work around to the issue. Bottom lab, do not disable DRS in vCenter. You will need it to allow vms to move around to satisfy their resource requirement. If you do not want a vm to move around, I recommend using the DRS rules to pin a virtual machine to a specific hypervisor. You can alternatively deploy that virtual machine on a local disk for a hypervisor that will prevent it from moving around. Ran into this KB article that speaks of the catalog status in vcloud to be shown as “Unknown”. In vCloud Director 5.5.0, the status of a catalog is based on a task stored in the database. This issue occurs when the catalog has existed for longer than the Activity Log of vCloud Director, the task may have been deleted from the database resulting in a catalog status of UNKNOWN. I haven’t run into this issue personally but you may have and VMware article states that this does not affect the catalog itself. Apparently there is no fix for this and the only resolution is to extend the activity log to 365 days. Don’t forget the space that is needed when you increase the number of days to keep for the log. 1. Log in as a System Administrator. 2. Go to the Administration section. 3. Navigate to General > Activity Log. 4. Update the number of days to keep to 365.